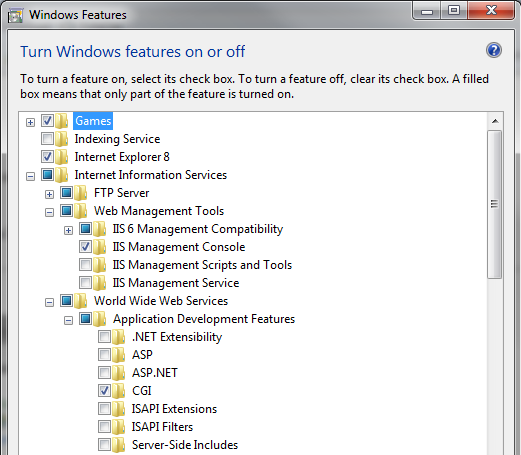 Now, start the IIS Management Console; just open up the start menu, enter inetmgr and hit Enter. 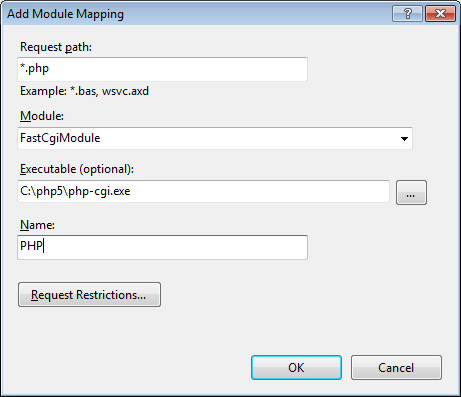 Navigate to the Sites/Default Web Site/Handler Mappings node and double-click on the "Handler Mappings" entry. As a result of this, the Actions panel on the right hand side changes. You now see an option called Add Module Mapping. Clicking on it opens up a dialog which you fill out as you can see in the following figure (you may need to adapt the path used to your local system). If you do not see the FastCgiModule entry, you probably forgot to check the CGI node when installing IIS. Otherwise, close the Add Module Mapping dialog by clicking on OK.
You need to confirm that you want to create a FastCGI application; click Yes.